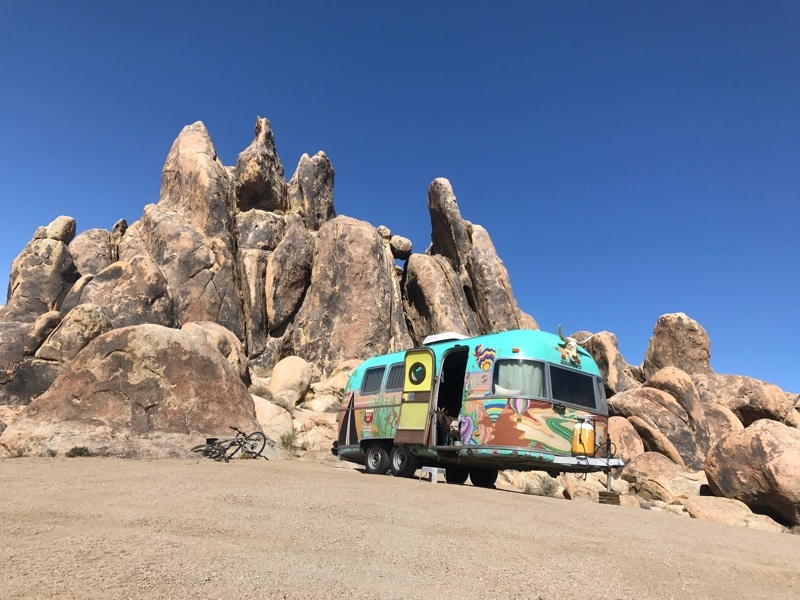 We pulled out of Big Pine city park and made the short drive to Lone Pine and our beloved Alabama Hills. The threat of snow was quickly fading in the rear view mirror, and the lava piles rose up in front of us. Within the hour we rolled into Lone Pine. 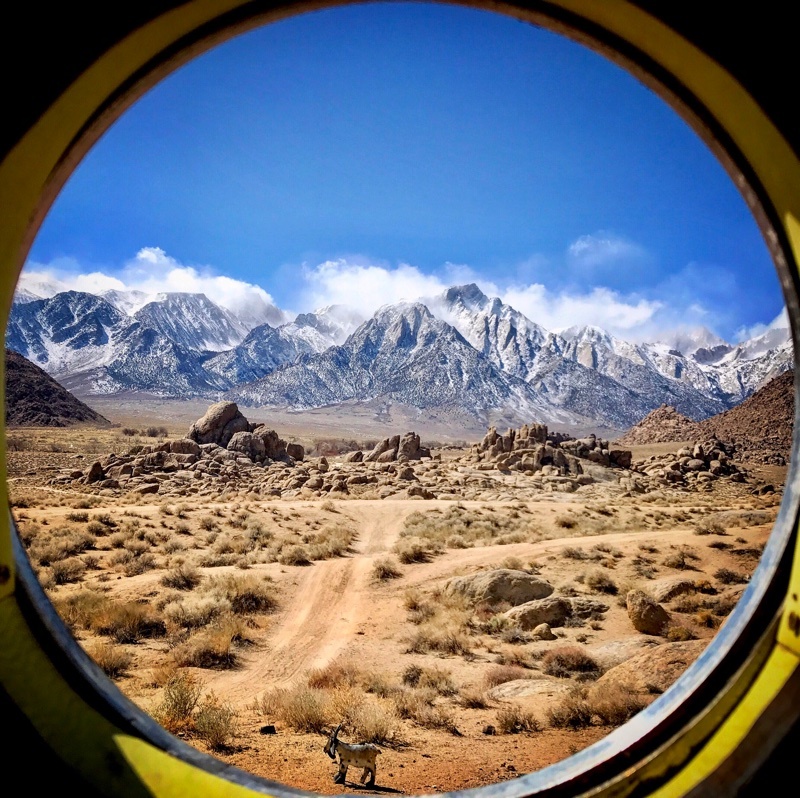 We reluctantly left the Alabama Hills behind October before last, not knowing if we’d ever return. It was one of, if not our favorite camping spots of our odyssey. As we passed the familiar stores on Main St. we bantered about how this was going to be goat heaven. Large elephant rocks everywhere, looking like they’re from any planet but ours. Above it all, the jagged eastern Sierra Nevada, crowned by Mt. 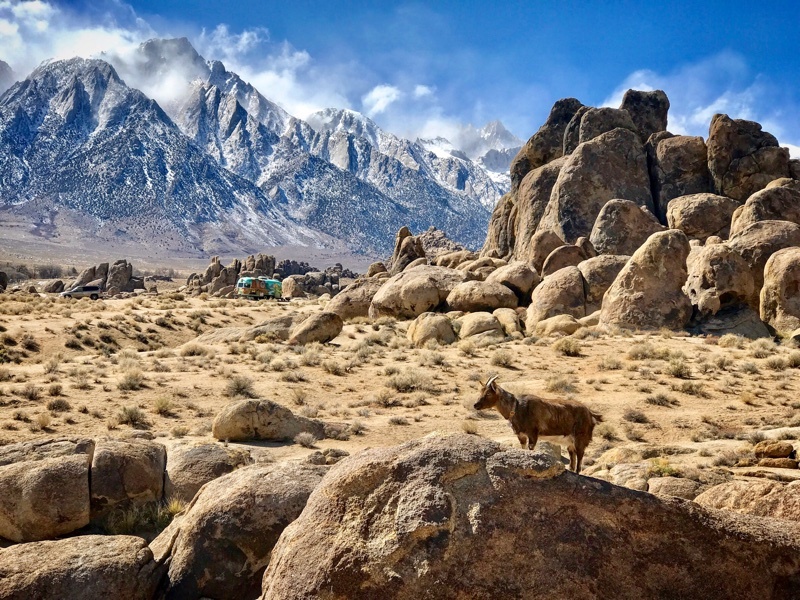 Whitney, loomed over the landscape. We pulled up to our previous camping spot behind Brenda, and unhooked the trailer. 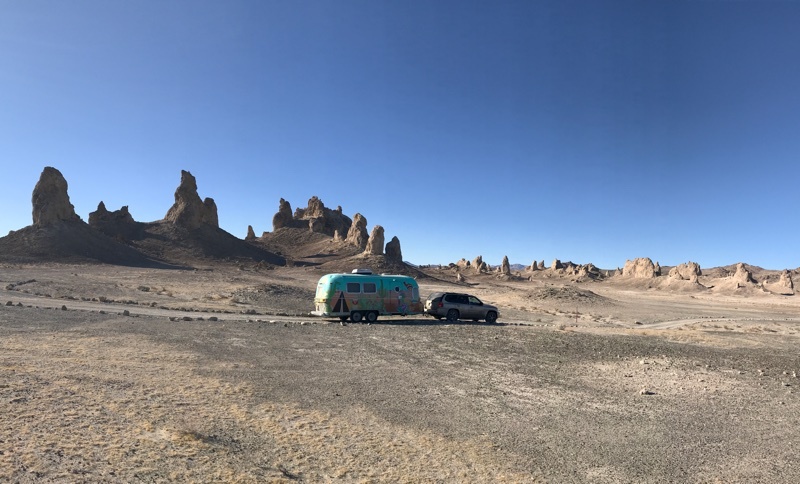 A common practice for us is to drop the trailer at what we figure is a so-so camping spot (or in this case, one we have already been to), and then drive the truck around looking for better spots. 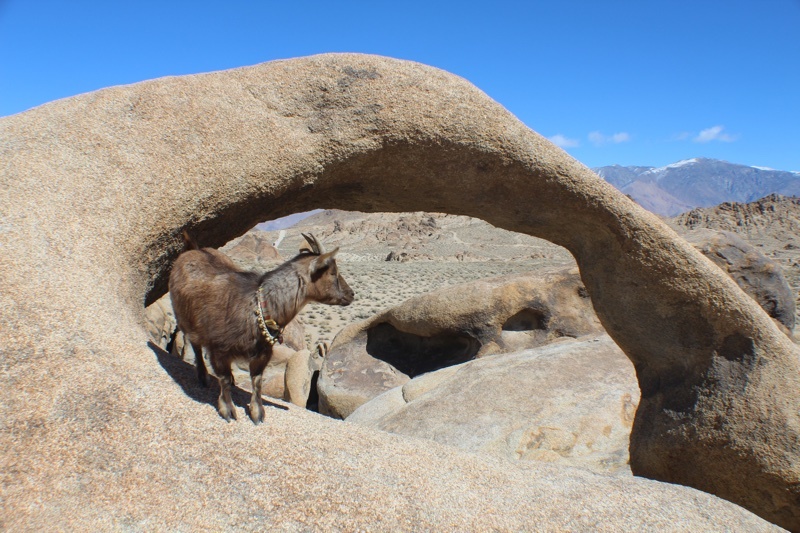 Alabama Hills has literally hundreds of spots, some in the open, some tucked away in nooks and crannies in the mazes of rock. We finally settled on an awesome spot that offered everything we were looking for: long range views of Mt. 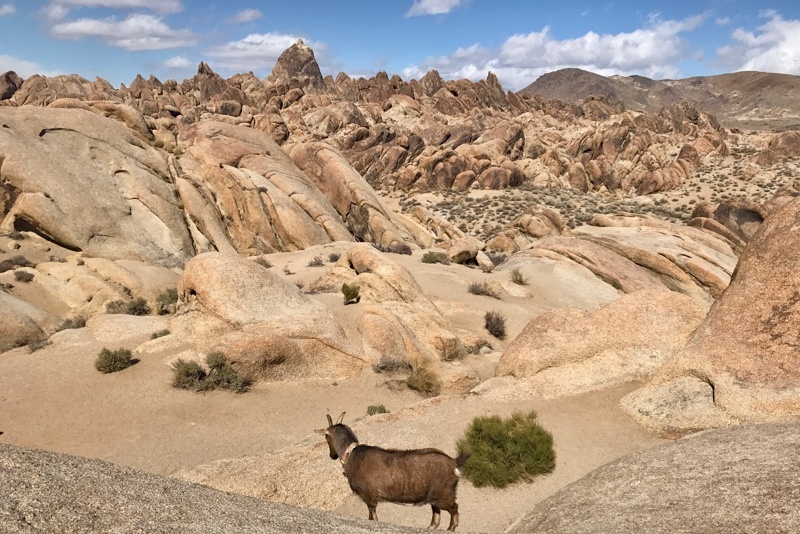 Whitney, being right next to the rocks, no other campers in sight, and a relatively easy approach road. At long last it was time to un-leash the Franks! The car door opened and she slowly woke up and started to look around. She stood up and then took a big stretch. Frankie hopped out of the car, squatted down to take a pee, and her eyes lit up as she looked around. 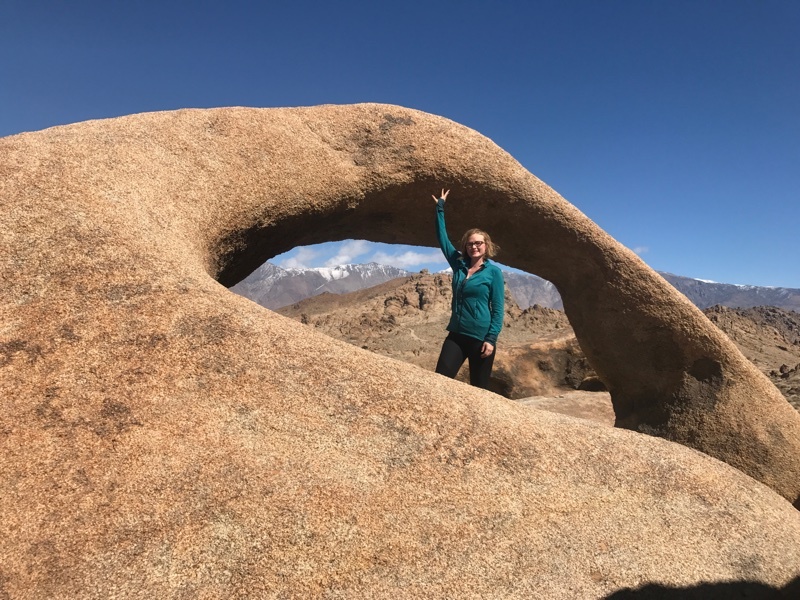 It was only a moment before she was climbing among the elephant rocks! 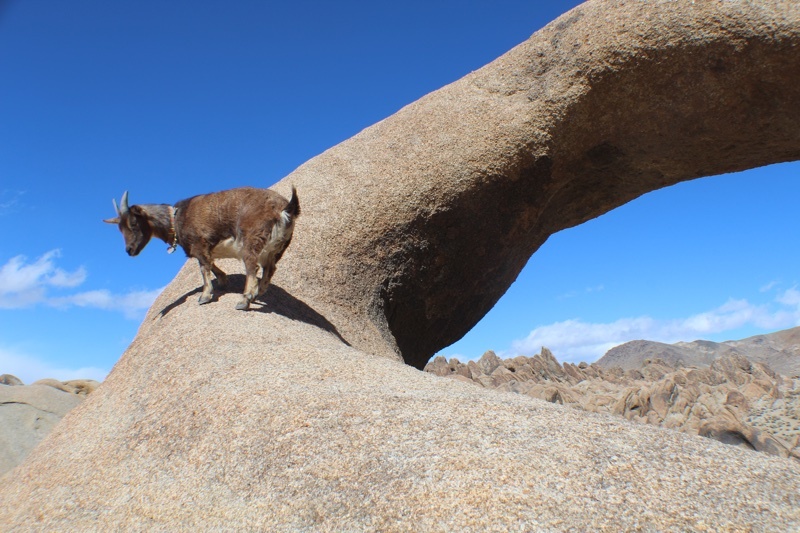 She leapt from rock to rock, stopping only to take in the view! This was indeed goat heaven. 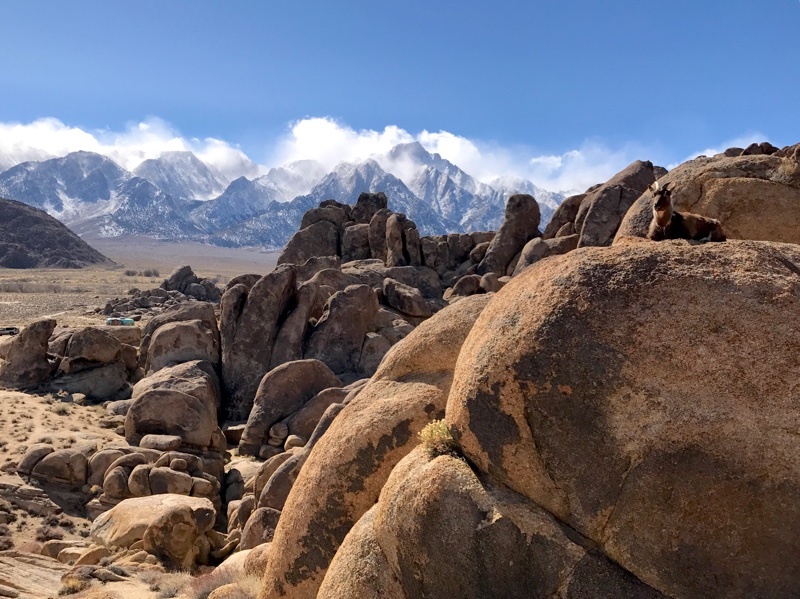 I was able to fit in some phenomenal mountain biking, and we took a trip to the foot of Mt Whitney to see the snow. 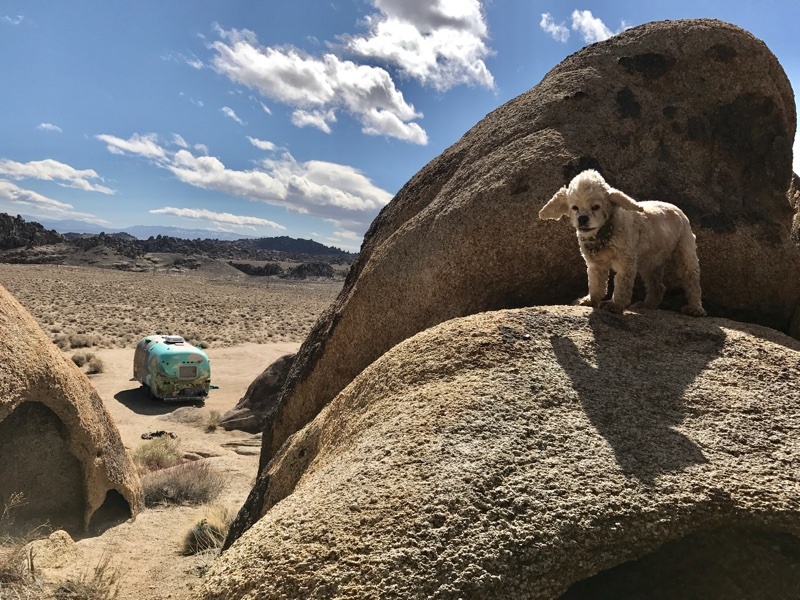 On Saturday we decided to give Maggies tired paws a rest, and left her to nap in the camper. 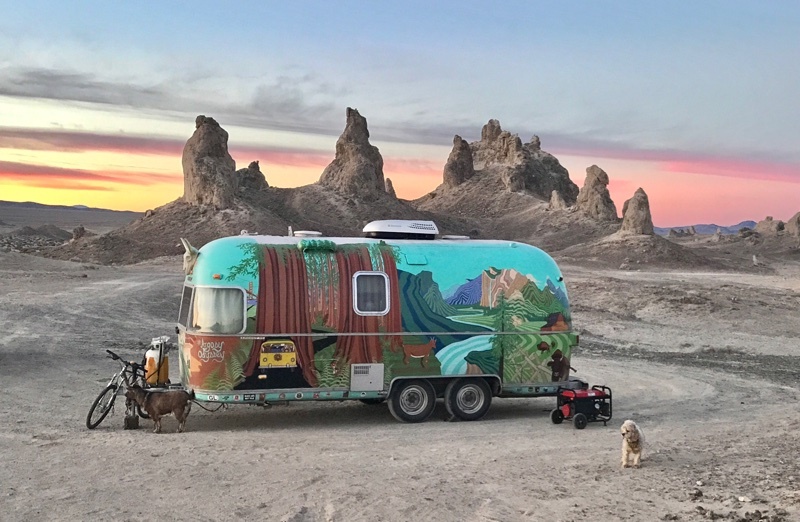 We wanted to get pictures of Frankie Rae at the Mobius Arch. We set off down Movie Rd. We drove over the first rise only to see a huge Navy Blackhawk helicopter sitting in the scrubland, and then dozens of police and search and rescue vehicles. I pulled an officer aside and asked him about all the activity. He informed me that every county in Southern California was here conducting search and rescue training in the rocks. As we hiked, the helicopter made low circles around the area. It was really thrilling to watch, but Frankie was not amusued. She always kept one ear to the sky, and bolted at every pass of the helicopter. Afterwards we explored another maze of rocks near our campsite. Our last morning in the hills greeted us with unusually calm winds and I was able to break out the drones. It is usually impossible to fly in this location due to the near constant high winds (unless you are a blackhawk pilot). This was a great location to test my fledgeling racing drone skills, trying to hug the rocks, and get out of my comfort zone. We took a few family snapshots, did our cross check, and were back on the road. 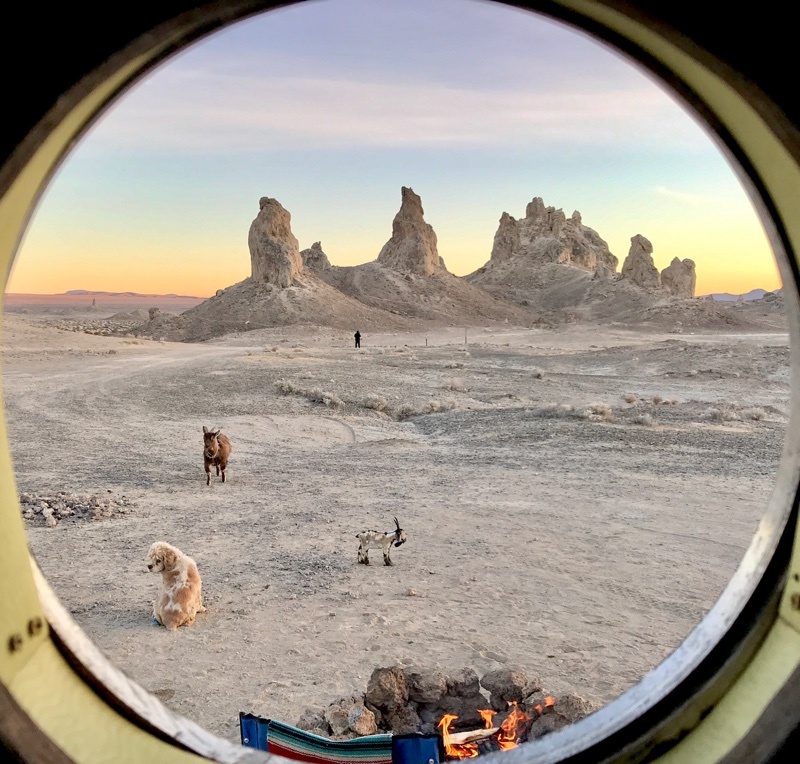 Next Stop, an overnighter at the Trona Pinnacles, a shooting location for planet of the apes and battlestar galactica. 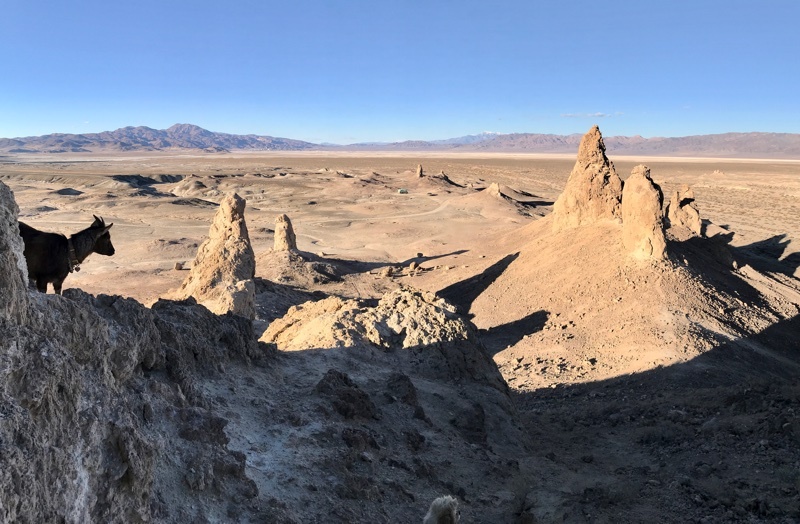 It was a bit of a haul to get to Trona Pinnacles. 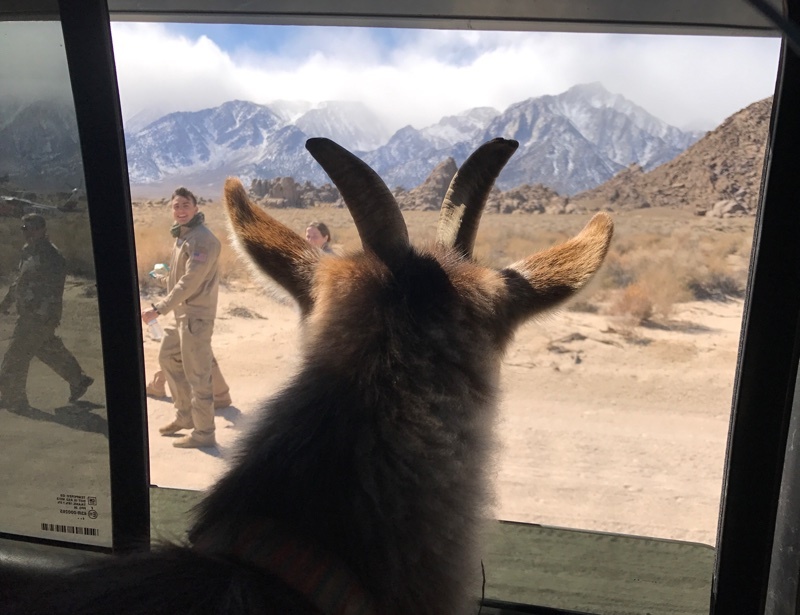 We drove along the Sierras, eventually peeling away and drove through Ridgecrest and by the China Lake Naval Air Weapons Station, a source of great conspiracy among some. 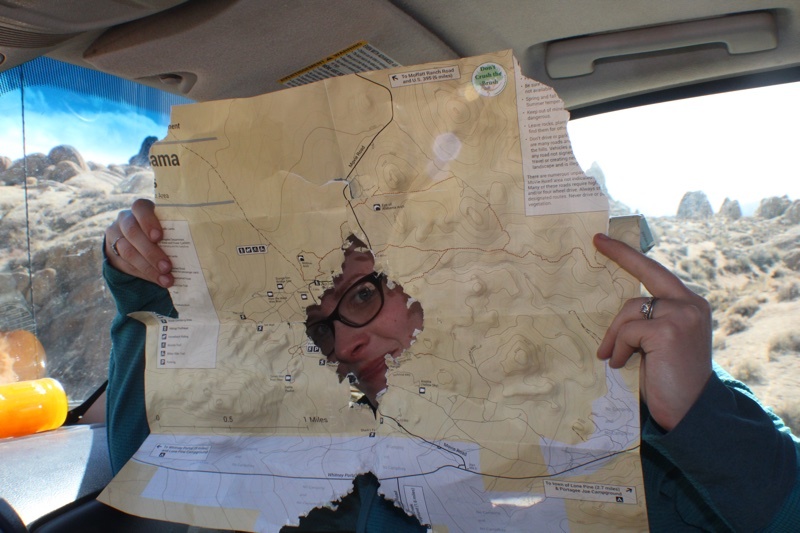 Thirty miles out of town we turned onto a dirt road…. a really, really, really long (did i mention long) and rough road. 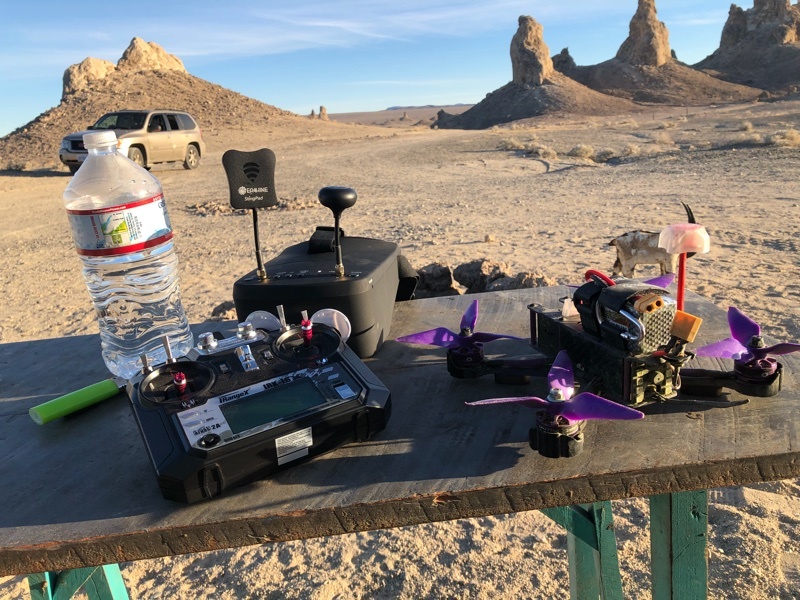 We finally found a great spot at the base of the pinnacles, took a hike, snapped some pics, and flew some more racing drone! As the shadows lengthened, we headed back to Ridgecrest to watch the Academy Awards. For any of our readers that weren’t aware, I was a set dresser on the movie Three Billboards Outside Ebbing, Missouri. 3BB garnered 7 nominations and picked up two Oscars! Thrilling for my first movie gig! Afterwards, we headed back to the pinnacles and bedded down for the night. We had a long drive to Southern California and the box canyons outside of Mecca the next day. Previous Post:Now’s the time, the time is now….Ramble on! So! I have invested my spare time between customers (I own a nature -loving retail store in Mineola, TX) for the past two days reading your entire blog from the beginning! Thanks for the adventures and allowing me to travel vicariously with you. 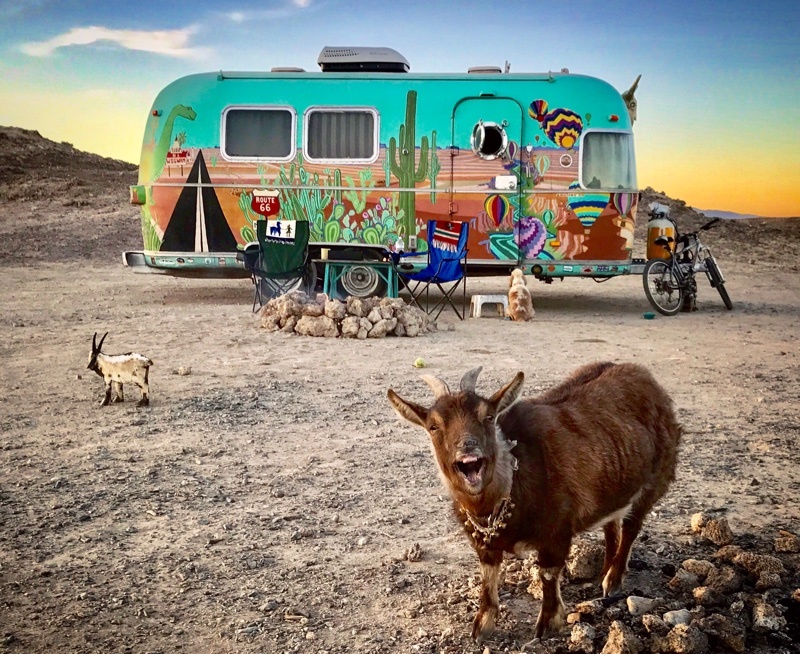 We have a 17′ Casita that is just itching to hit the road again, but I also have a mother that just moved in with us, so the itch will not be satisfied soon. Will be on the look out for future blog posts as you cavort in California – hugs and biscuits to Maggie and Frankie!